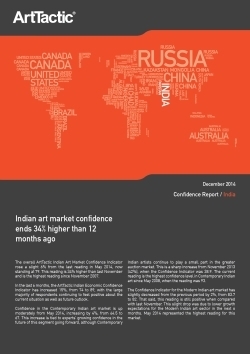 Indian art market confidence ends 34% higher than 12 months ago. The overall ArtTactic Indian Art Market Confidence Indicator rose a slight 6% from the last reading in May 2014, now standing at 79 and is the highest reading since November 2007. In the last 6 months, the ArtTactic Indian Economic Confidence Indicator has increased 15%, from 74 to 89, with the large majority of respondents continuing to feel positive about the current situation as well as future outlook. The Confidence Indicator for the Modern Indian art market has slightly decreased from the previous period by 2%, from 83.7 to 82. That said, this reading is still positive when compared with last November. This slight drop was due to lower growth expectations for the Modern Indian art sector in the next 6 months. Confidence in the Contemporary Indian art market is up moderately from May 2014, increasing by 4%, from 64.5 to 67. This increase is tied to experts’ growing confidence in the future of this segment, although Contemporary Indian artists continue to play a small part in the greater auction market. This is a sharp increase from November 2013 (42%), when the Confidence Indicator was 38.9. The current reading is the highest confidence level in Contemporary Indian art since May 2008, when the reading was 93. Report also includes Modern and Contemporary Indian artist confidence indicators and short- and long-term rankings.